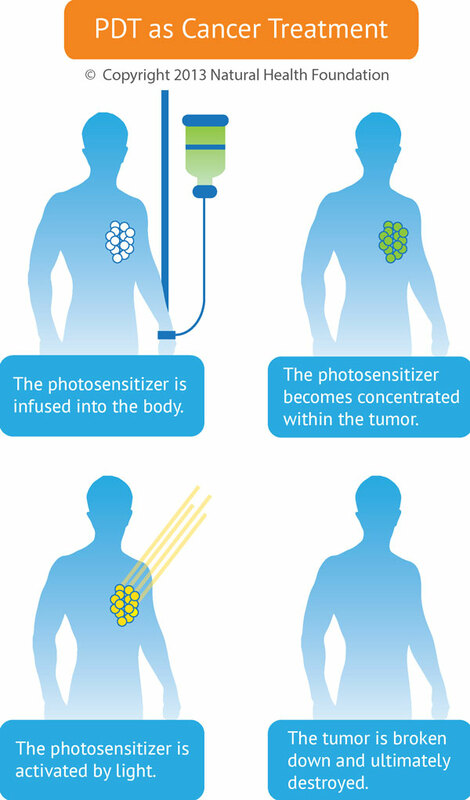 Photodynamic Therapy, or PDT, is a powerful approach to cancer treatment that involves the use of light to trigger a chemical reaction in abnormal or mutated cells, ultimately aiding in the destruction of those cells. This photochemical reaction is mediated through the interaction of light, a photosensitizer (light-sensitizing agent), and oxygen. PDT entails a three-step process. In the first step, the photosensitizer is administered to the patient. 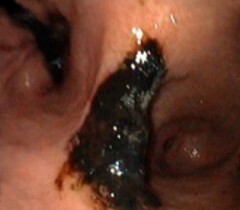 This is usually done by intravenous injection, but it can also be given topically (as a cream) or orally. The topical method is more common for skin cancers or other skin diseases. The intravenous method is more common for other cancer situations. The second step involves accumulation of the photosensitizer in the cancer cells or other target cells. This accumulation may take place over several hours or even several days. The key point here is that the light-sensitive substance accumulates preferentially in the abnormal or unwanted tissue, while very little accumulates in normal tissue. The best photosensitizers will selectively concentrate in the tumor tissues, thus setting the stage for the next step. In the third step, a specific wavelength of light is directed toward the target tissue, and the photosensitizer becomes activated in the presence of oxygen. Because the photosensitizer is mainly absorbed by diseased or unwanted tissue and the light source is directly targeted on that tissue, PDT achieves dual selectivity—that is, it maximizes damage to the diseased tissue and minimizes damage to adjacent healthy structures. In a typical PDT session, the target area is irradiated using a specified wavelength of light over the course of 15–20 minutes. The light source is usually a laser, and a system of light cables guides the light into the internal organs or areas of the body. The high concentration of photosensitizer in the cancer cells means that those cells will undergo damage and destruction due to highly toxic photochemical reactions. Over the next two to four weeks, the tumor steadily shrinks or regresses, all the while being replaced by normal, healthy tissues. PDT treatments can be targeted very precisely, so that the cancer tissue is destroyed while normal tissues are unharmed or mostly unaffected. This makes it an ideal cancer treatment. 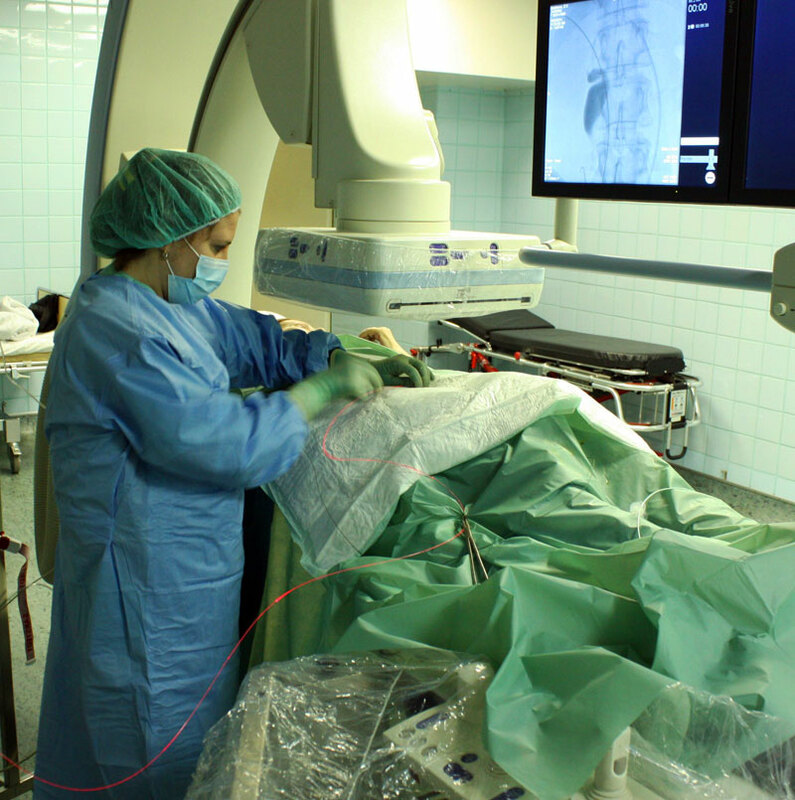 The more traditional forms of cancer treatment, such as radiotherapy, chemotherapy and laser ablation, do not offer such a high level of disease selectivity. This is why many cancer experts regard photodynamic therapy as an extremely promising therapeutic option. PDT is able to destroy malignant tissue or tumors through a variety of mechanisms. First, the light causes the photosensitizer to react with oxygen, which forms a group of compounds (Reactive Oxygen Species) that kill the cancer cells. Second,PDT can destroy the blood vessels that feed the cancer cells—essentially cutting off the nutrient supply to the tumor and helping to prevent the growth and spread (metastasis) of cancer. Lastly, PDT has a special impact on the immune system. The treatment leads to a form of cell death called necrosis as well modification of the outer surface of the tumor cells. Tumor antigens are released along with various “danger signals” that help render the cancer more recognizable for the immune system. Thus, PDT can help alert the immune system to attack the cancer. Photosensitizing agents vary in the ways they are metabolized or “handled” by the body. The ideal photosensitizer is taken up easily by cancer cells and retained within the tumor while being excreted fairly quickly by normal tissues. When the concentration of the agent is much higher in malignant than in normal tissues, this can lead to the highly targeted destruction of the tumor, with virtually no side effects. Bremachlorin® (clinically approved as Radachlorin® in Russia) is a photosensitizer that has undergone careful scientific evaluation and holds promise for optimizing PDT for cancer. It has been proposed that Bremachlorin-PDT’s high level of therapeutic efficacy is related to the ability to easily enter living cells and accumulate strongly in tumor tissues in contrast with the surrounding healthy tissues. Damage to the blood vessel supply upon which new tumor growth depends. Direct damage to the cancer cell’s internal structures, in particular the mitochondria and DNA. Thus, the three components in Bremachlorin® result in a unique, multi-faceted tumor-killing potential. This dynamic trio accounts for Bremachlorin’s success as both a therapeutic and diagnostic agent. And when used in photodynamic diagnosis (fluorescent diagnosis), this trio cause the entire tumor to glow or fluoresce. Researchers from two academic centers in The Netherlands—Leiden University Medical Center in Leiden, and Erasmus University Medical Center in Rotterdam—recently demonstrated that Bremachlorin displayed a more lasting tumor-killing potential compared to Chlorin e6 alone. These research findings were reported in the January 2014 Journal of Biomedical Optics and also in the March 2014 issue of Lasers in Surgery and Medicine. Cancers of the skin, bladder, brain, breast and lung are just a few of the cancers being considered for future studies of Bremachlorin-PDT. 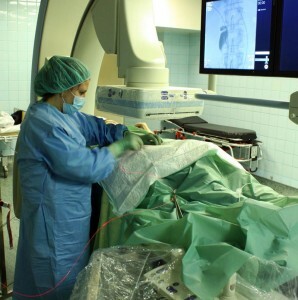 As a primary treatment, this approach has been especially effective in the elimination of small tumors—and in particular, more superficial tumors or those readily exposed to laser or other light sources. Preclinical studies are now under way in the Netherlands with a goal toward achieving clinical acceptance of Bremachlorin-PDT in the European Union. van Leeuwen-van Zaane F, Gamm UA, van Driel PB, Snoeks TJ, de Bruijn HS, van der Ploeg-van den Heuvel A, Sterenborg HJ, Löwik CW, Amelink A, Robinson DJ. Intrinsic photosensitizer fluorescence measured using multi-diameter single-fiber spectroscopy in vivo. J Biomed Opt. 2014 Jan;19(1):15010.
van Leeuwen-van Zaane F, van Driel PB, Gamm UA, Snoeks TJ, de Bruijn HS, van der Ploeg-van den Heuvel A, Löwik CW, Sterenborg HJ, Amelink A, Robinson DJ. Microscopic analysis of the localization of two chlorin-based photosensitizers in OSC19 tumors in the mouse oral cavity. Lasers Surg Med. 2014 Mar;46(3):224-34. 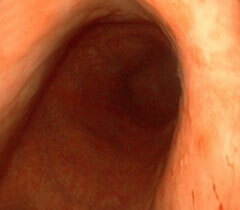 Treating Stomach Cancer with Photodynamic Therapy, Case 1. 1. Before Bremachlorin-PDT. Stomach cancer is invisible to the naked eye—here it only appears as a raised deformity or thickened fold of the stomach lining. Treatment begins with an infusion of Bremachlorin®, the photosensitizing agent that preferentially accumulates in the tumor. 2. Light Treatment. Light exposure to the stomach results in a potent reaction between light, oxygen and Bremachlorin®. 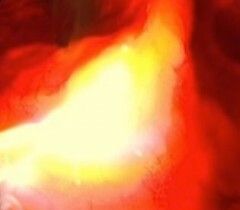 The light’s energy generates oxygen radicals and begins to trigger the tumor’s destruction. 3. After Bremachlorin-PDT. Within 24 hours, tumor destruction is clearly present as darkened tissue; this indicates a form of cell death known as necrosis—essential to triggering an anti-cancer immune response that eradicates deadly metastases. 4. 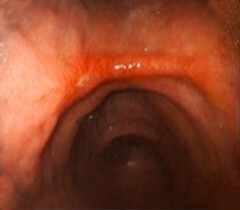 Complete Remission, 6 weeks after Bremachlorin-PDT. The tumor and abnormal tissue have completely disappeared, and the stomach is healthy again. 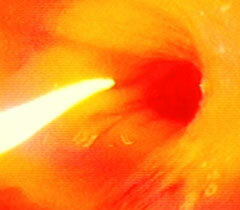 Treating Stomach Cancer with Photodynamic Therapy, Case 2. 1. Before Bremachlorin-PDT. Stomach cancer is present superficially in the areas indicated by arrows, invisible to the naked eye (type IIB, using the Japanese classification system). 2. Light Treatment. Light exposure to the stomach results in a potent reaction between light, oxygen and Bremachlorin®. The light’s energy generates oxygen radicals, triggering the tumor’s destruction. 3. After Bremachlorin-PDT. Within 24 hours, tumor destruction is present as a darkening of the tissue, indicating necrosis and thus a heightened potential for activating the anti-cancer immune defenses against metastases. 4. Complete Remission, 1 year after Bremachlorin-PDT. 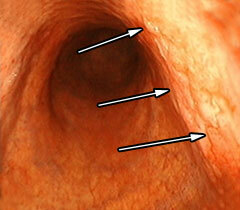 The cancer has regressed, and the stomach appears even healthier than before. These cases are from a May 2013 presentation at the 14th World Congress of the International Photodynamic Association in Seoul, South Korea.